QUARTILE.EXC Function in Excel returns the Quartile value for a supplied range of values based on a percentile range of 0 to 1 with both the values exclusive. 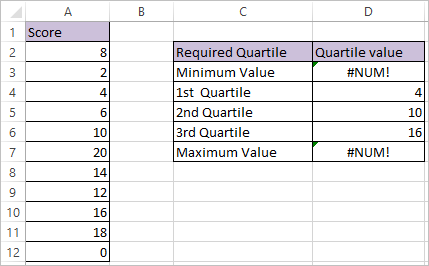 QUARTILE.EXC Function in Excel returns first quartile (25th Percentile), second quartile (50th Percentile), and third quartile (75th Percentile). QUARTILE.EXC Function does not return the Min value (0th percentile) and Max Value (100th percentile), because percentile of 0 and 1 are excluded. Quart value 0 returns #NUM! Error as 0th percentile or MIN value is excluded. Quart value 4 returns #NUM! Error as 100th percentile or MAX value is excluded.